It takes time. Mo needs to go out in non-threatening situations. So true about scotties being different. 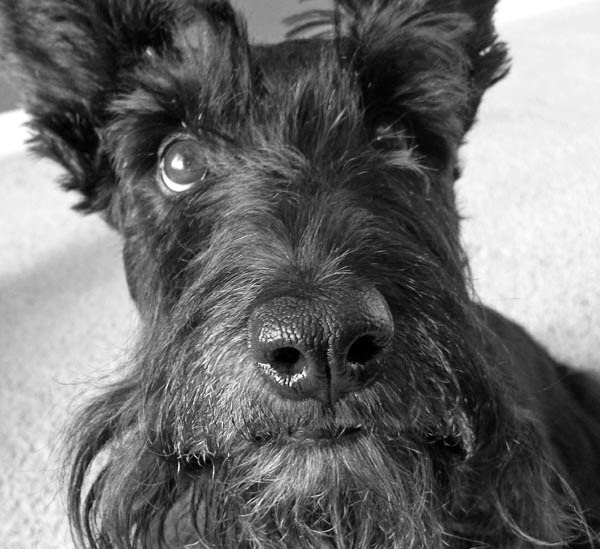 Kendra, my seventh scottie wasn't socialised as a pup and never liked people. She hated anyone who came to the house...or dared walk in front of it. She'd sneak around and attack an ankle from the back. She tolerated other dogs. Daisy, my eighth, loved everyone...just a happy girl. Bella, number nine, doesn't like people or other dogs. But after meeting some people enough times, she will tolerate them. I think your advice about being on neutral ground is a good one. Having had three Scotties from the time they were pups it would be different for me, but I have been definitely blessed by all three loving every people, children and other dogs. But from the time they were put in my hands they were socialized in puppy class through AKC Good Citizen classes and the learning never stops. They all learned the lesson that I am the leader of the pack. Not one of them enters the home before me and I think that steps teaches them a great rule of not challenging humans. But I know how those eyes can tempt you into accepting bad behavior. We have had Scotties for our entire marriage. over 30 years. They are all so different. We have two boys now that I rescued together as pups. They were a bit harder to train in twos. They have now formed their own pack. They are loving with us and our friends, but they were being walked and really went after my daugher's Labradoodle puppy who was being walked by me on the far side of the property. I just think I probably did not get them socialized early enough. They are so sweet and loveable that I just make sure they don't hang around with any other dogs. Sometimes you just have know the personality of your scottie and know that there are things you can do and things you cannot do to change the scottietude. I've owned 11 Scotties over the years. I have never had a people aggressive Scottie, but I have had a few that did not like other dogs with the exception of their siblings. Shelby loves everyone and every dog. Sidney has a fear of larger dogs,but will usually get along with dogs that are smaller than his size. You can't generalize. walking with other dogs for long walks really really helps! Lay him on his side when he's having one of his "bouts", it helps snap him out of it; if his tail is straight up keep him away from the other dog; socializing though not easy , is really the best solution, my Henry never liked puppies, so sounds like Mo doesn't either; labradoodle will soon be towering over him and he won't do that, as long as they learn to run around together. He may like a tug toy with other dogs to play with, The benefits ALWAYS far out weight the costs with a Scottie!! !